T-box is a connected-car-standard terminal that delivers multiple online applications including vehicle remote monitoring, remote control, safety monitoring & warning and remote diagnosis via 4G remote wireless communication, GPS satellite positioning, acceleration sensing and CAN communication. T-box can be divided into OEM and AM. Regarding OEM, T-box makers provide related services via OEM: has T-box directly connected with CAN Bus, ensure car-grade system, offer complete power supply design and ensure reliability. As to AM, T-box is plugged into car diagnostic port and can replace OBD. In addition, T-box can also be installed by changing original wiring, a way that may bring greater safety risks. Global passenger-car OEM T-box market will swell from USD300 million in 2016 to USD1.5 billion in 2020 at a CAGR of 49.53%. When it comes specifically to China, the passenger-car OEM T-box market is expected to be RMB2.9 billion in 2020. As many carmakers consider “going intelligent & connected” as the direction of future development, T-box installations have increased rapidly. Globally, due to widespread extension of GM OnStar, LG Electronics holds the lion’s share. As Harman spares room for Telematics module in its multimedia control system, it occupies a larger share among luxury brands. 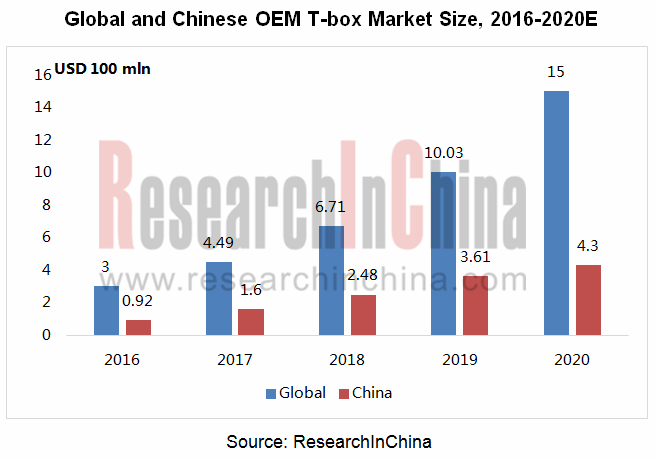 Domestic T-box suppliers include Huawei, ZTEWelink, Thread, Flaircomm Microelectronics, Yaxon Network, FutureMove Automotive, Neusoft, INTEST, Jiangsu Tianan Smart Science & Technology and PATEO. Founded in 2011 and headquartered in Shenzhen, Thread specializes in production and solution design of automotive OBD and T-box products. 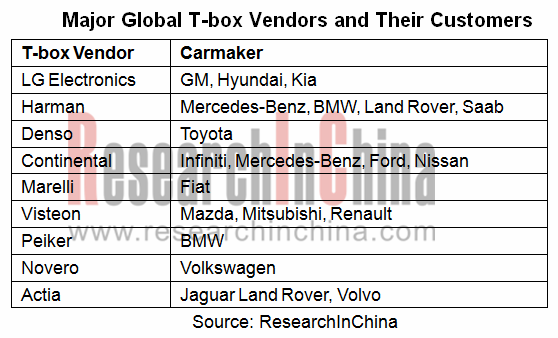 Its OEM clients include Toyota, Honda, Nissan, GM, Hyundai, Mercedes-Benz, Audi, Great Wall and BAIC with T-box. Established in 2008 and headquartered in Fuzhou, Flaircomm Microelectronics provides mainly Automotive OEM Bluetooth, WiFi, 3G/LTE wireless communication modules, and T-box. It serves main OEMs and Tier1s like Volkswagen, GM, Chery, JAC, Geely, Desay SV, Clarion, Delphi, Denso Ten, Hangsheng, and Pioneer. Set up in 2004 and headquartered in Wuhan, INTEST, a subsidiary of Xingmin Intelligent Transportation Systems Group, is engaged mainly in NEV T-box business. Its share of OEM T-box products in the Chinese NEV market was 60% in the first half of 2017. Major OEM customers are BAIC BJEV, Zhongtong Bus, Changan Automobile, Dongfeng Commercial Vehicle, Nanjing Golden Dragon Bus Manufacturing, BYD, Geely Commercial Vehicle, BAIC Foton and Dongfeng Liuzhou Motor. Major domestic T-box vendors (profile, T-box products, supporting, partners, etc.). 4.1 Huawei Technologies Co., Ltd.
4.2 Shenzhen ZTEWeLink Technology Co., Ltd.
4.3 Shenzhen Thread Technology Co., Ltd.
4.5 Xiamen Yaxon Network Co., Ltd.
4.6 FutureMove Automotive Co., Ltd.
4.8 Wuhan Intest Electronic Technology Co., Ltd.
4.9 Jiangsu TIANAN Smart Science & Technology Co., Ltd.